Four new Faux-Stained Glass Fiber pieces FINISHED! My sister Sonya told me I needed a "studio assistant" but, in truth, I already have one. 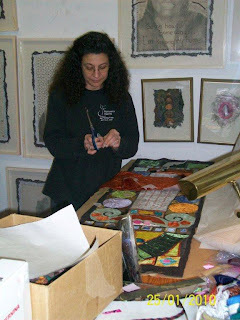 My wonderful husband Steve has been assisting the impossible schedule that is allowing me to work over eight hours a day on my faux-stained glass fiber pieces while still managing our "paying jobs...framing". 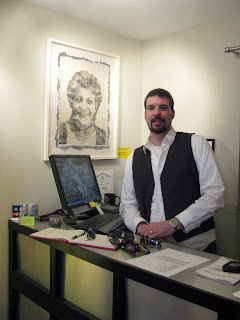 He's driven my commissioned piece to the Grovewood Gallery in Asheville, NC; restocked our antique booth at Terrace Oaks Antique Mall in Charleston, SC; delivered my successfully juried piece in the Florence (South Carolina) regional juried show; bought a bolt of WonderUnder (Bond-a-Web) from Hancock Fabrics; and ironed several 12' black curtain panels for the upcoming exhibition. He cooks and cleans too! If this isn't "studio assistant"....I don't know what one might do! Thus, I've used my soldering iron on the first four of six faux-stained glass pieces....needed for the upcoming exhibition that opens this Thursday! (The original six were SOLD just two weeks before the show!) 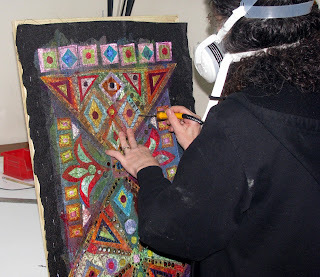 Yes, melting acrylic polyester felt and stretch velvets embedded with previously painted WonderUnder does smell....and the air likely isn't very healthy to breathe....so I wear my ventilation mask! 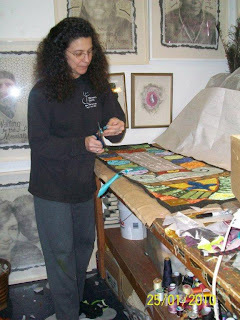 I'm splitting my time between working at Mouse House (my antiquarian and limited framing business with my husband Steve) and my studio....where I'm knee deep in polyester velvet, painted WonderUnder (Bond-a-Web) and enjoying hours of free motion stitching on at least four large faux-stained glass pieces! 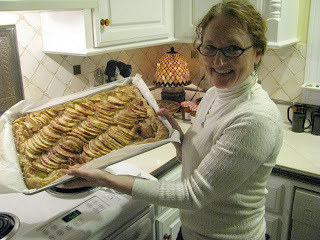 My friend Kim Bendillo of Garvin Designs took these photos Monday night. By day Kim plans the interiors of major architecture projects. Next week, however, she is "setting my cemetery". 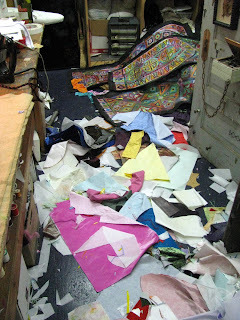 We discussed the upcoming installation while I snipped shapes and ironed them into place. 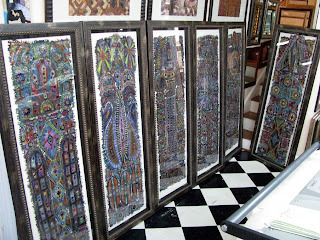 As of last night, four panels (approximately 58" x 18") were constructed and two are completely stitched with 100% cotton thread awaiting my soldering iron....then melting, mounting, and framing. I'm quite sure four will definitely be done....and, if possible, two more! 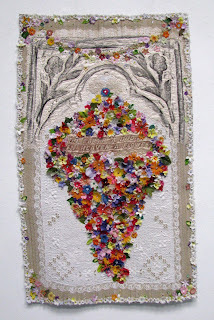 Artificial Flowers, Grave Rubbing Art Quilt...and a "Good" Problem to Have! 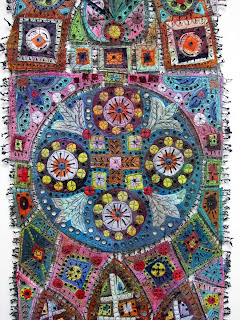 This is the last art quilt I planned to finish before my upcoming exhibition. The show is scheduled to be installed on Wednesday and Thursday...February 3rd and 4th. So, I'm ahead of schedule on this score. I'm really excited, especially since Kim Bendillo of Garvin Designs is "setting the cemetery". 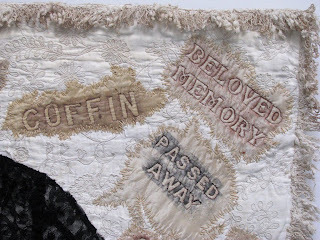 There will be over 30 Grave Rubbing Art Quilts on display as well as 25 piece in my Angels in Mourning Series....plus the sheer chiffon banners with free-motion embroidered epitaphs hanging under the skylights at Gallery 80808/Vista Studios. All the flowers came from my many dumpster diving trips to local cemeteries. After retrieving the blossoms from the trash, I dissected each one....discarding the plastic and wire....leaving only the fabric. I washed them, lay them flat to dry, and separated the tiniest flowers into separate plastic bags. I knew I wanted to stitch these little flowers on something. I didn't know at the time that I'd create this quilt. 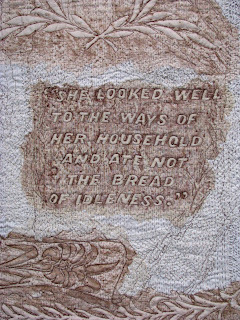 In fact, I already have an art quilt with these words on it. It is called On Earth a Bud. Thus, I'm calling this one Artificial Flowers. 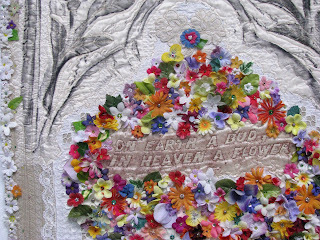 When I made the earlier piece with this epitaph, I did attach a few small, white blossoms....but I didn't think of really going over the top with them....until more recently! 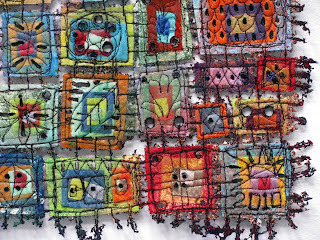 It was lots of fun to stitch and bead. Also, the background is mostly machine stitched. I liked this variation too. 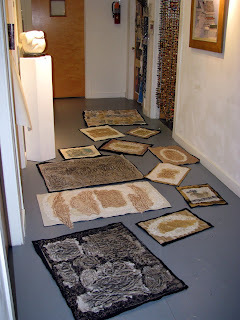 (Above: Twelve Grave Rubbing Art Quilts....as designed and pinned....on the floor....last September. Click on image above. 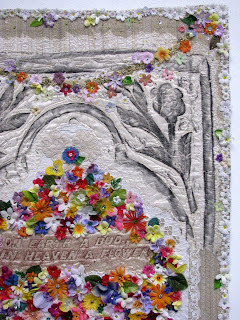 Last September I designed and pinned twelve Grave Rubbing Art Quilts. These represented more work than I possibly thought I could finish....but I got them done! In fact, the newest pieces in the series, Ready for Burial and Artificial Flowers, weren't even planned at the time. I wouldn't have believed that I could stitch so many so quickly. It is a good thing I work fast! I need to work fast....faster than ever before. 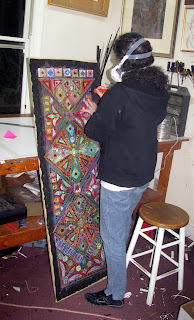 Last June I created six faux-stained glass fiber pieces. Above is a photo of them...finished, framed, ready for exhibition. 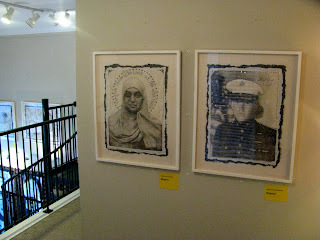 They were part of Blues Chapel at the Greater Denton Arts Council's Gough Gallery from November through the first week in January. They were intended to be shown at Gallery 80808/Vista Studios when I stage Blues Chapel again. When one sold, I still had five....until late last week. Countybank in Greenwood, South Carolina just bought the other five. Now....with less than two weeks before the opening and only nine days before installation, I find myself with a "good" problem....working faster than I've ever worked before. 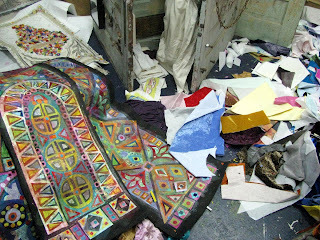 The studio is an absolute disaster area. Yards of polyester velvet with WonderUnder (Bond-a-Web) ironed to the back are everywhere. I'm almost out of painted WonderUnder too. 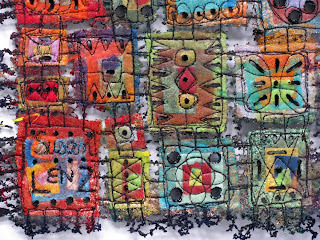 These pieces are approximately 58" x 18". After non-stop work this weekend, I've got three ready to stitch....then solder, melt and frame. Gotta run now....no more time to blog! Although I've been busy getting ready for Blues Chapel and Last Words, my solo exhibition at Gallery 80808/Vista Studios (February 5 - 16), I spent most of the past weekend working on a commission from the Grovewood Gallery in Asheville. The client wanted the piece to be a horizontal and avoid hot pinks and purple and pastels. This is the result. Most of my In Box pieces can hang as either a horizontal or a vertical. I've stitched my initials or name and date in the corners in ways that allow for either orientation. Knowing, however, that this would be a horizontal. I signed my name in the lower left box and dated it in the lower right with all the letters lining up to the "bottom". 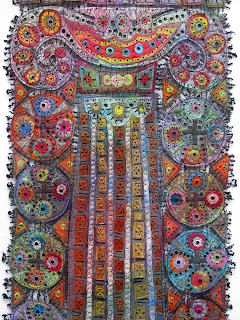 This series was originally inspired by the architecture of Freidensreich Hundretwasser, the Austrian artist who designed fanciful, eco-friendly building with brightly colored mosaics and wall treatments. I'm currently reading a great biography....more inspiration! Getting ready for the exhibition and NEW WORK! There is excitement in the air at Gallery 80808/Vista Studios. The new year started off with Jeff Donovan's mid-career retrospective and this Friday opens the 10th Winter Exhibition of new work by Stephen Chesley, Mike Williams, Edward Wimberly, and David Yaghjian. 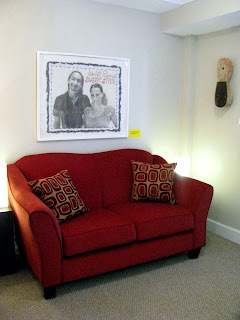 Jeff, Stephen, and David all have studios at Gallery 80808/Vista Studios. All these artists are among my friends. (I consider Stephen Chesley my artistic mentor.) It is exhilarating to be around while artwork is being installed....especially when the next show is Blues Chapel and Last Words! The energy has fueled my preparations! 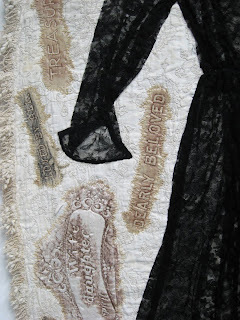 This week I've finished the "next to the last" grave rubbing art quilt, devised hanging rods for all 30+ art quilts, made identification labels, distributed the exhibition cards to various locations all over town, taken photos and blogged about my partner Blue Martini, and sent more press releases. I also updated the "church bulletin". The flowers were given this month with sincere appreciation, thanks and acknowledgements to Mr. John Whitehead, Columbia Music Festival Association; Deb Dyer and The Staff of the Greater Denton Arts Council; Karen Watson, Sumter Gallery of Art; Jessica Coppin; Gita Larson; Chuck Herin, Pegheds, Inc.; Dorothy Warren, Tourism Coordinator at Region 2 Discovery Center in Edgefield; Allen Coleman, Executive Director at the Pickens County Museum of Art and History; Kim Bendillo, Garvin Designs; Mary Langston; members of Susan’s Artist’s Way group; The Blue Martini; Shannon Purvis; Porter Barron; the cyber community of fiber artists reading http://artbysusanlenz.blogspot.com; Dr. and Mrs. Henry and Linda Lenz; Steve, Mathias, and Alex Dingman; and especially the musical inspiration of these early, female Blues professionals. I'm excited that Kim Bendillo has agreed to "design" my cemetery. She's very, very talented and a professional interior designer....the kind that earns her living at a full service architecture firm making selections for major building projects like dormitories, churches, office buildings, and the like. Like Steve and me, she's a graduate of The Ohio State University. I know the cemetery is going to be FABULOUS! Kim is also one of the people who participated in the Artist's Way group I recently facilitated. 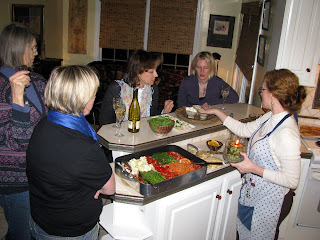 The group has continued to meet monthly....checking in on one another's artistic adventures. Last time we met was at Kay's house....and it was a blast. Kay is QUITE a cook and a very generous hostess. The group is assisting as volunteers to install Blues Chapel and Last Words. Lucky me....a professional designer and an entire crew of helpers! There is definitely an air of excitement and fun! 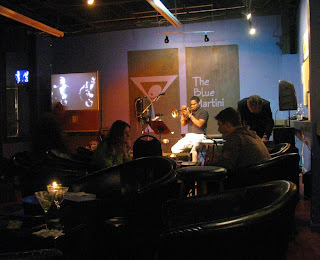 Great photos from Blue Martini! The excitement is growing! 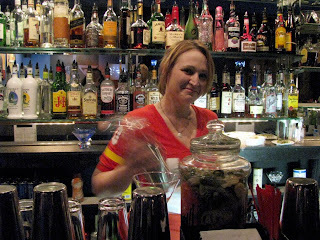 The Blue Martini and I have a blog for our joint venture. It is HERE! The partnership between music, art, fine beverages and good friends is going to be terrific! I can hardly wait to install. Yesterday I finished all the rods for the art quilts and distributed exhibition cards to various locations throughout Columbia. 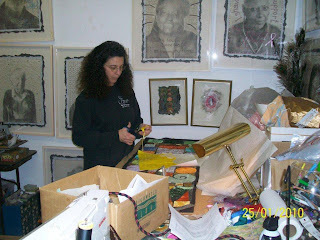 I've also enlisted Kim Bendillo, of Garvin Designs, to make the hanging selections for "Last Words" (cemetery portion of the dual art installation. I am SO LUCKY to have such talented friend....a working professional who ordinarily selects the colors, designs, materials, and interior schemes for large projects...like dormitories, churches, new office buildings, etc. Kim was in my Artist's Way group. Other members are helping with the installation too! 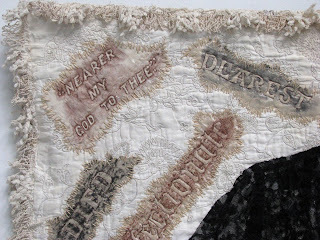 Most of my Grave Rubbing Art Quilts are designed in my studio while playing with the fabrics and vintage linens.....but not this one! I saw the vintage black lace dress hanging on the upstairs wall at Terrace Oaks Antique Mall in Charleston and simply knew it would be the focal point for this piece. My mind's eye could almost see the grave rubbing words floating around it on a vintage bed covering. I could hardly wait to start stitching even while I waited in line to pay a mere $18 for the garment. As luck would have it, I already owned the bed covering. It was old, tattered, and had holes; but, it was beautiful. I cut out a shape around the dress....irregular...to dodge the worst of the damage. 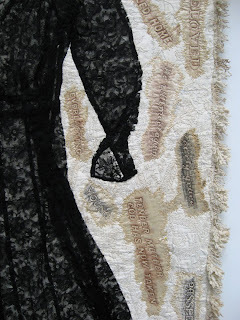 I pinned the bed covering and dress onto a large piece of recycled black felt. 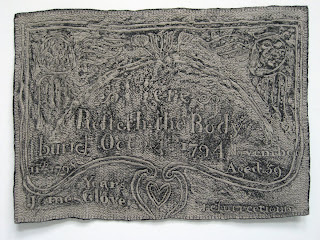 It was fun rummaging through my grave rubbings for the words: Coffin, Past Away, Nearer My God to Thee, Affectionate, Died, Dearest, Treasured, Early Grave, Beloved Memory, Called Home, etc. 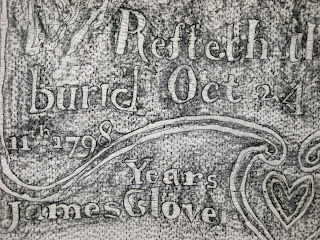 These rubbing were made in cemeteries from California to Maine to places in faraway England. I pinned them in place around the dress. 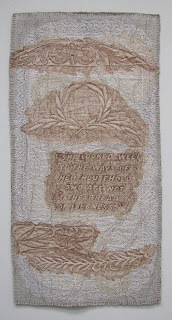 Over the Christmas holidays I stitched the words into place....as if "patches". 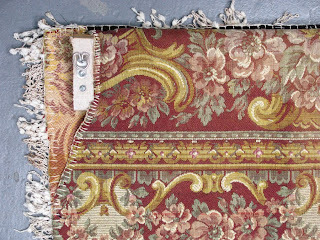 I had removed the fringe from the bed covering when I originally cut it. There was enough that wasn't damaged to go around the entire piece...but I didn't just stitch in in place. The fringe on the top hangs downward; the fringe on the other three sides hangs outward, like it originally did. Next came the free motion embroidered outline around all the letters. I'm totally in love with King Tut's Superior Thread 992. 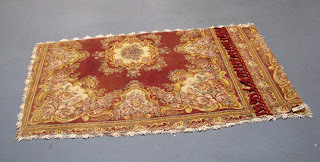 It's a variegated brown that is simply perfect. I was worried that the texture of the bed covering would make the free motion stitching difficult, but it didn't! 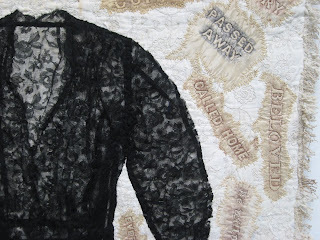 The presence of the dress is the first time that one of my Grave Rubbing Quilts suggests a human body. Thus, I decided on the name Ready For Burial. 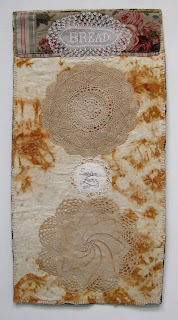 It is also the first time that the actual rubbings aren't the focal point of the quilt. I'm very excited about pushing this series into this new direction. I feel like this series is developing on its own....I'm just along for the ride and to do the stitching. It is an exhilarating experience. I hadn't really thought about the reverse which is a good thing. A friend donated three beautiful, old tapestries to my stash. One seemed perfect....very Victorian in appearance, much like the dress. It wasn't long enough but I cut it and created a most unique back. Of course, the fringe added a new "problem". The back isn't totally flat now. I built a rod that includes a half inch projection on which the hanging device was screwed. As a result, the piece looks great on the wall. It hangs about a half inch away from the wall, not showing a bulge where the reverse fringe is. I'm really thrilled about how this work has turned out! 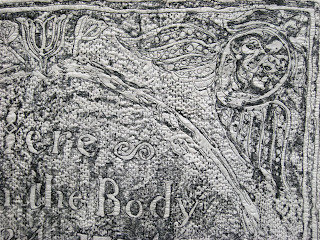 Most of my Grave Rubbing Art Quilts are collages of various rubbings. 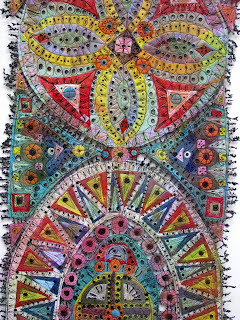 This, however, is a whole quilt but it is still a collage of sorts. The actual tombstone was quite large, several feet long and flat on the ground. I made the rubbing of the top with most of these words and then of the bottom...eliminating the entire middle. Generally, I don't include names but "James Glover" was actually at the very bottom, outside the surrounding design elements. It seemed unique and "right" in that place. I selected the word "reƒurrectionis" from the middle section and added it to balance the name. I love the old words, like "Reƒteth" and the apostrophe in "buri'd" instead of "buried". I thought about calling this piece "James Glover" but in conversation, mostly with my husband, I continued to call it "Eccles Two". Why? Because I already created "Eccles"....henceforth Eccles I. I shared the earlier piece HERE. Like it, Eccles II has a unique reverse. 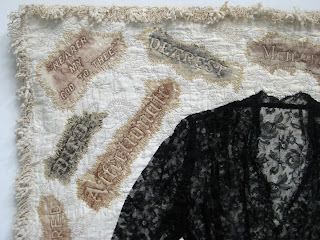 With the exceptions of making the rubbing, outlining the words in free motion, creating the back, and pinning.....this piece was entirely stitched in the car to Pennsylvania and back...and the edge was stitched in the Penske rental truck going back to Texas. I love riding....and stitching! It is the only way to travel! 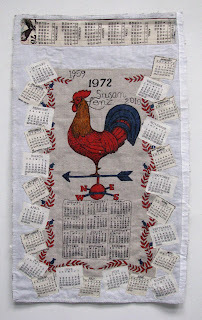 This back was created from an old tablecloth my sister Sonya gave me over the New Year's holiday. To it I added a lace collar from my friends Ed and Bert. (Bert and I are often found bidding on table lots at Bill Mishoe's weekly auctions....and this is probably where the lace came. 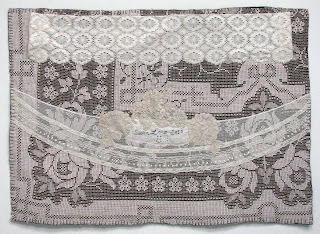 I added several other pieces of lace I'd purchased at Bill's auction!) Click on the reverse to enlarge and see my name free motion stitched in the middle. I just posted two short video clips of Blues Chapel....straight out of the camera....on my Video Blog. The first one is HERE (15 seconds!) and the second one is HERE (only 10 seconds!). These were taken just moments before we packed up the show to return home at the Greater Denton Arts Council's Gough Gallery. The show was there from November 22, 2009 until January 6, 2010. 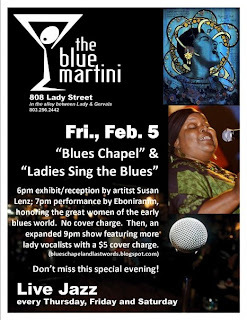 Next, Blues Chapel will be at Gallery 80808/Vista Studios, 808 Lady Street in downtown Columbia, South Carolina from February 4 - 16, 2010! I'm "knee deep" in work and very excited! PAM....Professional Artist Member at SAQA! 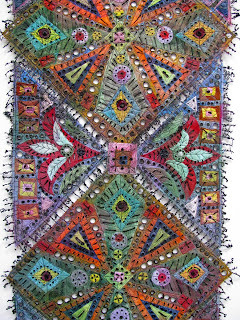 My name and two quilts are now part of the SAQA's extremely impressive list of accomplished art quilters. To see my listing, click HERE! 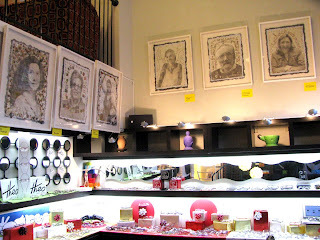 Recently I was given the opportunity to hang the Decision Portraits at a local, upscale eyeglass shop on Main Street. It's called Frame of Mind and it's located is less than a mile from both my studio and house. For the past several months, the owner, Mark Plessinger, has been jump starting the after hours/arts scene in downtown Columbia with a "first Thursday" event called FOM Series. Past events (which have grown to include several other businesses and vacant buildings on the same block as well as a staging area right on the street!) have included everything from Columbia City ballet's scantily clad vampiresses doing a scene from Dracula: Ballet with a Bite to inspired contemporary dance by the new Wideman Davis Dance Company; sculpture, photography, ceramics, paintings, and mixed media works by artist as diverse as Barbie Mathis, Jeanee Bourque, Alicia Leeke, Anastasia Chernoff, and Virginia Scotchie; an installation by Eileen Blythe and music...music....music! Unfortunately, I won't be able to attend the opening. Steve and I will be halfway to Texas. 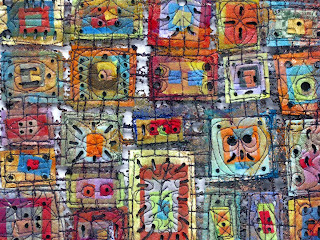 We're picking up Blues Chapel from the Greater Denton Arts Council's Gough Gallery. My friend Cindi Boiter will be filling in as me for the night. I've armed her with fliers that explain the concept behind the Decision Portrait Series and exhibition cards for my solo show next February. 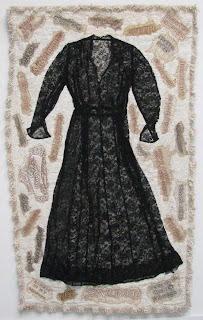 In addition to the portraits, I have several matted and shrink wrapped pieces of mixed media work for sale....photo transfers on book pages with beading and stitching....from two early series: Black God and Life Everlasting. I selected these because they are "text" related. During the reception this Thursday, January 7 from 6 - 9 at Frame of Mind, 1520 Main Street, there will be poetry readings by by award winning poet and author Cassie Premo Steele at 7:30; Melissa Buckner, Kristine Hartvigsen, and Christopher McCormick at 6:30 and 8:30. (Kristine was in my recent Artist's Way group....so I'm especially sad to be missing this art event!) Also, cellist Heidi Carey will be playing. I know there are several people wondering about the Decision Portrait Series...especially those who have either contacted me as a potential model or have already signed model's releases and provided images. 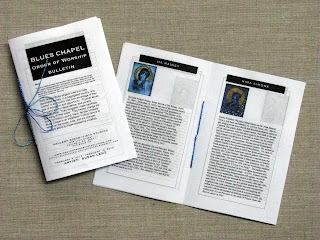 Please understand, I have been working hard on my upcoming solo show Blues Chapel and Last Words. It now has its own blog. 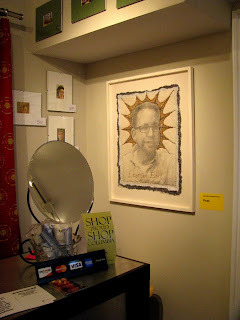 When the installation is mounted, I will obviously be returning to the Decision Portrait Series stitching. It is very exciting to be working on so many projects as one time. It takes a great deal of planning and thinking ahead....to the days in the gallery manning the show and stitching on portraits!